DC DC Power provides a broad range of rack mounted DC power systems, UPS systems, rectifier modules and batteries. We work with the world’s leading manufacturers of mission-critical systems to help ensure that all our clients receive the latest technology and most reliable infrastructure to meet their demands. Eaton 3G Access Power Solutions are the ideal solution for low to medium power telecommunications applications requiring compact, efficient and flexible DC power supplies. These 19” rack mount systems using either 24V or 48V Eaton 3G Access Power rectifier modules supply output up to 300A or 600A (respectively). Enatel DC power systems are the ideal solutions for powering telecommunications and data networks supplying 24V, 48V or 60V DC. Enatel’s Ultra Compact DC Power Systems range in power output from 1.0kW to 4.0kW and have a maximum output current of 83A. They are the ideal solution to meet the requirements of telecommunications applications such as access nodes and micro/pico base stations. Utilizing Enatel’s intelligent controllers and modular rectifiers our standalone 1U and 2U Ultra Compact DC Power Systems have been designed to be easily installed into any standard 19” rack and can be customized and configured to meet the individual requirements of each customer. The SENTINEL DUAL (High Power) range is available in 3.3-4-5-6-8-10kVA single-phase models and 6.5-8- 10kVA three-phase/single-phase models, with on-line double conversion (VFI) technology. The DIALOG DUAL range may be placed directly on the floor or mounted in 19” rackmount cabinets such as the Multi Shelter range. In terms of technology, features (selectable On-line, Economy and Smart Active operating modes), and diagnostics such as the digital display, RS232 and USB interfaces, network adaptor card option and PowerShield³ software include. SENTINEL DUAL (High Power) is easily the best solution for protecting “mission critical” applications requiring the highest levels of reliability. SENTINEL DUAL (High Power) is ideally suited for a whole range of applications from IT to security. The APC Smart-UPS On-Line includes CD with software, Comms cable, Documentation CD, Installation guide, Removable support feet, Temperature Probe, USB cable, Warranty card, Web/SNMP Management Card. Eaton APR48-3G Access Power Rectifiers are designed specifically for network access applications such as cellular base stations, customer premises equipment and road-side cabinet installations. The new generation 3G architecture of the APR48-3G Access Power Rectifier has improved space utilisation so rack space can be maximised for use with telco equipment and not power equipment. The APR48-3G size has been reduced by approximately 50% with an increase of power output by 20%, over the previous model. This more than two-fold increase in its power density allows as little as 2U of rack space to be occupied by power. Operating with the Eaton SC100 or SC200 series of system controllers, the APR48-3G rectifier modules will provide years of cost-effective, and trouble free service for your 48V network access equipment. Since setting the new standard for rectifier efficiency, the Flatpack2 HE family is now available in a variety of voltages and power ratings, all with superior efficiency up to 96.5%. With more than 4 billion in-field operating hours and a proven cumulative field MTBF of more than 1,9 million hours, Flatpack 2 HE is the only HE (High Efficiency) rectifier with a proven track record. This is designed to distribute A and B 24V or 48V DC supplies to duel fed telecoms equipment within a cabinet. This provides duel DC distribution from one PDU. 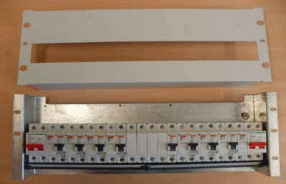 An input is taken from each Power Supply Unit to one of the dual pole isolators at the end of the row. This is then distributed to up to 5 ways, each way consisting of a positive single pole terminal block and a negative single pole C curve MCB of any value from 1A to 63A. For the specification of the MCB please see the various manufacturer’s web sites. We reserve the right to change manufacturer from those pictured. This is designed to distribute a single 24V or 48V DC supply to telecoms equipment within a cabinet. An input is taken from the Power Supply Unit to the dual pole isolator at the end of the row. This is then distributed to up to 11 ways, each way consisting of a positive single pole terminal block and a negative single pole C curve MCB of any value from 1A to 63A. For the specification of the MCB please see the various manufacturer’s web sites. We reserve the right to change manufacturer from those pictured. 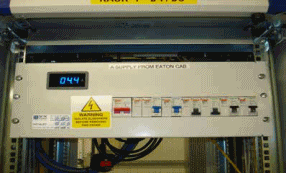 This is designed to distribute a single 48V DC supply to telecoms equipment within a cabinet. An input is taken from the Power Supply Unit to the dual pole isolator at the end of the row. This is then distributed to up to 11 ways, each way consisting of a positive single pole terminal block and a negative single pole C curve MCB of any value from 1A to 63A. For the specification of the MCB please see the various manufacturer’s web sites. We reserve the right to change manufacturer from those pictured. The meter displays the total DC Amps distributed by the PDU. The PowerSafe® V Front Terminal range of valve regulated lead acid batteries has been designed specifically for use in applications that demand the highest levels of security and reliability. With proven compliance to the most rigorous international standards, PowerSafe V batteries are recognised worldwide as a premium solution for Telecom applications. The reputation of PowerSafe V batteries for long service life, together with excellent high rate performance, also makes it ideal for high integrity, high specification UPS systems. The DataSafe® HX range of valve regulated lead acid batteries has been designed to offer superior solutions for the Uninterruptible Power Supply (UPS) and Information Technology markets. DataSafe HX batteries are the ideal source of power to protect vital systems and incorporates select design features that maximise reliability while ensuring superior performance and an excellent service life. Built on advanced electrochemistry and backed by over 100 years experience in battery technology and manufacture, DataSafe HX monoblocs have been specifically developed for high discharge rate applications.